Is it going to hold up? Did I completely overreact to the pain I felt last week? Do I actually have a stress reaction, or fracture, or other terrible, bone-related outcome? Am I going to get partway through the race and have to drop out because the pain is too bad? Am I going to have so much adrenaline that I won’t notice how bad the pain is until after the race, at which point the damage will be done and I’ll definitely have a stress fracture? Am I going to spend all 13.1 miles, all hopefully-just-under-two-hours of running worrying about it, derailing my mental game and ruining my race? Reason #2: My mental state. Obviously, I have had saner moments in my life (see: above). I’ve had a hard time sleeping all the way through the night recently, and every time I wake up my mind is already going one billion miles per hour. There’s no bleary-eyed, “What time is it?”, no turning to look at the clock and being relieved I still have time before my alarm goes off. Nope, it’s zero to one hundred–or rather, dreaming one hundred to waking one hundred, because I’m all about stressful dreams these days, apparently. So then I don’t sleep well, and I worry about not sleeping well, and I worry that my worrying is making everything worse and will keep me from having a good race, and round and round we go on the merry-go-round of anxiety. I found having a visualization session to be very helpful prior to the marathon in October, so I’m trying to do my own at home: putting on some meditation-y music from YouTube, laying down, closing my eyes, and walking (running?) myself mentally through the race: what it’ll look like, what it’ll feel like, etc. It’s somewhat helpful–I suppose I won’t really know how helpful it is until Saturday–except when I see things I don’t want to see in my mind’s eye, like a 2:01 on my watch after I cross the finish line >.< I need to get my head in the game, but right now my head is too stressed to do anything but sit on the sidelines fretting about the game. Things could be going better, clearly. I KNOW, I KNOW. I don’t need anyone to tell me that worrying about the forecast 1) isn’t going to change it and 2) isn’t going to make anything better for me. Trust me, I know. But I am OUTRAGED that the forecast calls for sun and highs in the 60s on Saturday. OUTRAGED, I SAY!!!!11!1!! *shakes fist at sky* I want 45 and overcast, not 60 and sunny! I would go so far as to say that I need 45 and overcast. Admittedly, the forecast still has time to change, and the race is at 7 a.m., so it’s not like it’s going to be in the 60s and sunny at the start–or, honestly, at the finish–so I’m almost certainly worrying about nothing. But when has knowing that I’m worrying about nothing stopped me? 2. Though I’m not doing a good job of it right now, I do need to remember that regardless of what happens on Saturday, it’s not like this entire training cycle was for naught. It helped me get a big, surprising PR at the Shamrock Shuffle. That’s not really what I was shooting for with this training, but it’s also not nothing, so I’ll happily take it. I got a lot stronger through this training, too, which is also not nothing. I set some lifting PRs, which felt good. I also have arm and leg muscles I’m very proud to show off, which is closer to nothing than the other things I’ve gained from this, but still isn’t nothing. Even if I don’t hit my goal time on Saturday, this training made me stronger, faster, and fitter, and that’s worth celebrating in and of itself. But I still hope I hit my goal time on Saturday. 3. And to reward you for getting through all of my half marathon hand-wringing: a non-half marathon-related item! I’ve never voted in person on Election Day since I registered to vote in Illinois. I voted early a few times, but even waiting in those lines got annoying, so after the 2016 presidential primaries I have exclusively voted by mail. The convenience is undeniable: all I have to do is confirm my address online, and the Board of Elections will mail a ballot to my house! A ballot I can fill out whenever I have the time and desire to do so! A ballot I can take DAYS to fill out if need be! It makes voting so easy…but it does come with one major down side. When you vote by mail, you don’t get a wristband, which means you don’t get the opportunity to passively show off how good of a citizen you are on Election Day. Even though I knew I was a good citizen for voting, I wanted tangible evidence of it! I wanted to post smug pictures bragging about my participation in democracy on Facebook too, darn it! I very, very seriously considered voting in person on Election Day this past Tuesday solely because I wanted a wristband, and this was my last chance to get one. I worried that it would get in the way of my morning strength training workout however (typical), and ultimately decided that for the good of exercising both my body and my right to vote, I should vote by mail instead. I accepted my fate and applied for a ballot online. The ballot came with an insert that directed you to the a video about how to vote by mail, which I highly recommend watching regardless of whether or not you’ll ever vote by mail in Chicago exclusively for the candidate names on the sample ballot (highlights include Abraham Lincoln and Stephen A. Douglas on the presidential ballot, Daniel Burnham for Plan Commissioner, William Wrigley, Jr. for Park Commissioner, etc. As someone who occasionally needs to come up with pretend names for training purposes, I applaud whoever at the Board of Elections came up with these candidates). YOU GUYS. VOTE BY MAILERS GOT WRISTBANDS THIS TIME. I literally squealed with delight. I couldn’t believe it!! My dream had come true! I could finally be smug on social media, too!!! And all this, after I had accepted my fate of never receiving a wristband! I, obviously, wore it all day Tuesday. Thanks! It’s been good for most of this week so far, so fingers crossed! Did looking back at those posts and seeing success despite the anxiety help at all? 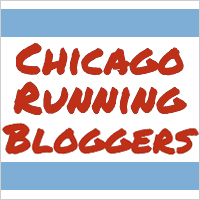 Did you fee this way before your AWESOME Chicago Marathon last year? I’d be annoyed with the sun and 60s too. But yeah, it won’t hit that high until later. Just don’t even think about the weather (except extra bodyglide, heh). Your visualization session will help! A tip I read (and keep meaning to blog about, oops) is visualizing yourself getting through an obstacle. So that might be seeing a 9:20 split instead of a 9:09/9:00 and planning how you’ll react. And now I’ve given advice which is super annoying. Sorry! I am totally rooting for you!!! Oh! And I meant to say, I am so sorry your sleep has been like that. That’s horrible and sets you up for feeling horrible all day! It did help a little – mostly just knowing that I’ve been this worked up before and everything’s turned out just fine. Being nervous clearly doesn’t have to mean things are going to go poorly, which is nice to know. That’s a really good tip about visualizing an obstacle! I’ll be a lot more prepared to react positively if I think through what I’ll do ahead of time, I bet. Thanks! 60s and sunny sounds FANTASTIC! I hope the race ends up being awesome! GOOD LUCK!